For those who still haven’t adopted a responsive website, there’s no better time than the present. The benefits are almost overwhelmingly in your favor, often outweighing the initial investment. Here’s ten reasons to stop procrastinating and switch to a responsive web design, today. If one of your tracked metrics isn’t bounce rate, it should be. This tells you the percent of users that are leaving your particular web pages without taking an action, like clicking a call to action (CTA) or filling out a form. Responsive sites load faster. And as most SEOs know, a website that takes longer than 2-3 seconds to load https://www.impulsecreative.com/blog/responsive-web-design-for-mobile-seooften gets abandoned for a quicker loading link. That’s one of the reasons why in 2014, Google announced its preference in ranking responsive sites. As more site owners shifted to responsive design after the announcement, the average mobile bounce rate dropped from 52% in 2016 to 47% in 2017, according to a study by Stone Temple. Mobile-friendly websites are more engaging and oftentimes load faster, keeping searchers on the site longer and clicking around. User-experience (UX) is the experience a person has while on your website, determined by how easy or pleasing it is to use. Those without a responsive or separate mobile website will likely have a frustrating UX for smartphone or tablet users. They will be forced to pinch and zoom in to see text, struggle to submit information on glitchy forms and will likely bounce back to the SERPs to get their answers. So what does a good UX look like? Here’s some companies who do it well, tailoring their responsive design to make shopping or learning easier for their customers, with features that slay on both desktop and mobile searches. Google understands that “retaining users is crucial to improving conversions,” as quoted by Developer’s Fundamentals. That’s why the search engine crafted a tool for comparing your mobile site speed, using an Impact Calculator, to demonstrate how just one second of quicker load time could increase your revenue. Collect more user information and gain new leads, while searchers are on-the-go. Responsive sites are extremely adaptive to forms, making it easy for mobile and tablet viewers to plug in information using simple drop-downs. The proof is in the pudding. One site featured on Think with Google found that their “time to convert” decreased by 40% after adopting responsive design. Still not convinced? Read our article about how better UX can increase your conversion rates. Nearly 40% of smartphone owners said they use social media apps more frequently than their other apps, according to a study by The Manifest. That’s not surprising. People love scrolling through popular networks like Facebook, Instagram, Pinterest and more on their smartphones to pass the time. Back in 2014, app usage hit a milestone and half of all social media consumption was already happening on mobile, according to ComScore. If users are clicking through from your social networks to your website, it’s likely happening on their smartphone. Whether they are reading an interesting article from your blog, or signing up for webinar on a landing page, a responsive website guarantees that these social visitors have a smooth user experience. Social users aren’t the only ones using on-the-go devices. In general, worldwide traffic is becoming exceeding mobile-heavy. Over 47% of all global traffic came from mobile in 2018, according to Statista. 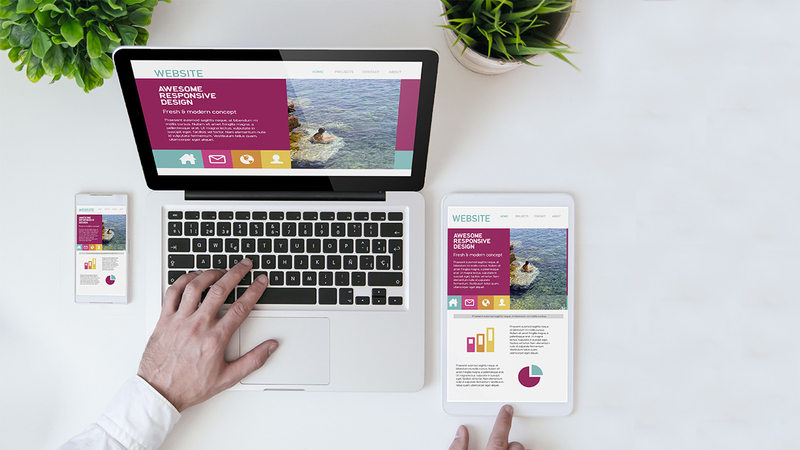 With nearly half of visits happening on smartphones and tablets, it’s more important than ever to adopt a responsive site design. In fact, Google itself has released a series of algorithm updates to favor mobile experiences, oftentimes choosing to serve mobile-friendly websites over desktop versions. Learn more about this change by reading about Google’s mobile-first indexing update. Responsive design adapts to the screen size, not the device, like a separate mobile website does. You can’t ask for a template that fits a standard tablet size, because with evolving technology, there is no standard. For example, different generations of iPads vary in width and height, but a responsive site molds to any and all. This is especially important, as screen sizes are changing constantly. People are viewing websites now on devices big and small. From smart watches— roughly the size of a half dollar to a quarter— to large televisions, your site needs to respond to anything future technology holds. People are now starting to view sites on smart eye glasses! On technology like this, your unresponsive site won’t stand a chance. Today, your competitors probably already have a responsive site, or at the very least a mobile-friendly domain. That’s because your competitors have seen the stats and are adjusting to the demands of their customers. Adobe found that seven in 10 (that’s 73%) of content “must display well on the device” for a user to stay engaged. And that was back in their 2015 State of Content Report. Think of how those numbers must have dramatically increased over the years! In order to contend against those in your industry, you need to stay on the same playing field, with responsive design. Because responsive websites typically load faster and improve the user experience (as mentioned above), this type of design helps to keep mobile users on your website. Longer sessions and more click-throughs tell search engines like Google that your domain is helpful to searchers, no matter what device it’s viewed on, and to keep serving the page to answer queries. In fact, Google oftentimes won’t even serve a desktop version of a site on a smartphone if a more mobile-friendly site exists, choosing to rank the easier to use version. Here’s some common responsive website design SEO questions to defend this type of site’s ability to transform your organic rankings. Seventy nine percent of smartphone users have made a purchase online using their mobile device in the last six months, according to 2019 research. People are using their devices make quick buys, but even sites without an e-commerce style checkout can likely still attribute a portion of their revenue to mobile experiences. Users find your products or services online, or to find content related to your industry knowledge, and use that information to make educated purchasing decisions. Where are a lot of those searchers finding you? On mobile. Whether you accept direct sales through your site or not, more and more people are window shopping from their phones or tablets. One of our clients attributed a $16,000 sale to the help of one blog post, which gained the customer’s trust. If their blog and site wasn’t mobile-friendly, they might have lost that revenue to a competitor. Not only is it easier to maintain one responsive domain than to maintain unique mobile and desktop versions, using just one responsive site can save your team time and money. The coordination, planning and communication required to update both sites can get expensive, and frankly, it’s wasteful. A responsive website adapts its design to the device a viewer sees your pages on, without you needing to do too much tinkering. We’re talking about a site that makes educated adjustments on its own verses flat pages that never change unless manually adjusted. Ready to Switch to a Responsive Website? If any of these ten reasons to adopt a responsive site design resonated with you, stop procrastinating! The right partners can help you make the switch with ease and help you see quick returns on your investment. Learn more about our website design services to make your site responsive, today.